If the number of rows is not divisible by number of groups, you may have groups of two different sizes. We will use the following Employees table for the examples in this video. 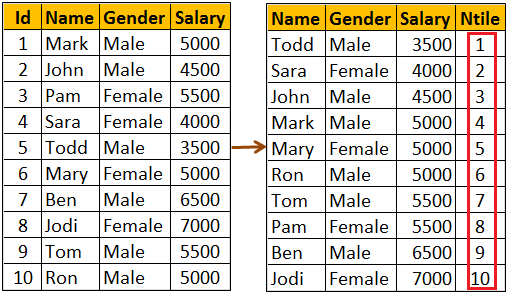 NTILE function without PARTITION BY clause : Divides the 10 rows into 3 groups. 4 rows in first group, 3 rows in the 2nd & 3rd group. 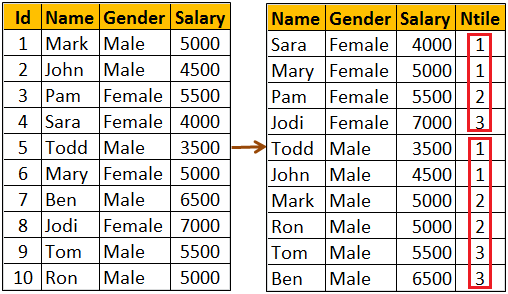 NTILE function will try to create as many groups as possible with one row in each group. 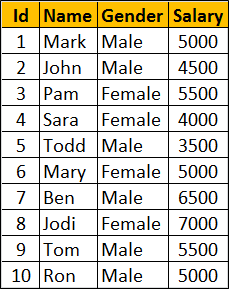 With 10 rows in the table, NTILE(11) will create 10 groups with 1 row in each group. 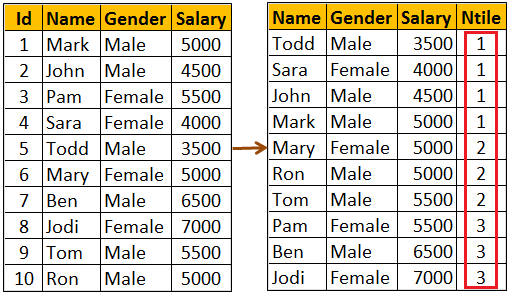 NTILE function with PARTITION BY clause : When the data is partitioned, NTILE function creates the specified number of groups with in each partition. The following query partitions the data into 2 partitions (Male & Female). NTILE(3) creates 3 groups in each of the partitions.